New year, and much of the same routines here! I'm thrilled with that because I'm very lucky to be able to enjoy and indulge in my favorite pastimes of cooking, baking, and eating. Here's to happy cooking and feasting in the new year, and always! Like so many people, I'm a fan of Ina Garten's and adore watching her cooking show. I'm no expert but there's something about an Ina Garten recipe that usually manages to surprise you a little bit even when you already expect it to be good. Her recipes are clearly well thought out and whatever it is we're cooking or baking, she's figured out a way to squeeze out, or amplify, every bit of flavor possible. So you don't have to twist my arm to try one of Ina's recipe - particularly when it involves chocolate! For a chocoholic like me, it's nearly impossible to resist a recipe called "triple chocolate loaf cakes". And you can be sure that if Ina's offering a chocolate recipe, it's going to be unmistakably chocolate. Here, bittersweet chocolate and unsweetened cocoa (along with a touch of coffee) bloom in boiling water to create the foundation for these cakes. Then, chocolate chunks or chips add another decadent and delicious dimension. I opted out of adding walnuts to these loaf cakes. Personally, I adore nuts in baked goods but I was making them to share with others and went with a nut-free version. This recipe makes 2 regular-size loaf cakes. I made 4 smaller loaves so I could share with friends. To offset our smaller slices, we just had to cut ourselves an extra one, which was easy enough. This moist, chocolaty cake satisfied my daily chocolate craving. I love the light yet almost fudgy texture to the cake, and the serious chocolate flavor doesn't disappoint. 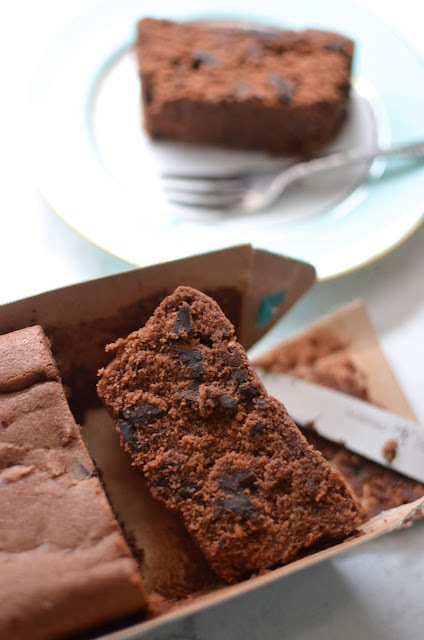 Not too surprisingly, there is something a little extra special about this particular chocolate loaf cake recipe.